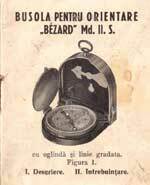 NOTE: the following article deals with the original Bézard compasses and their imitations but detailed information is still missing. Thank you for any detail concerning the production years of the various models. 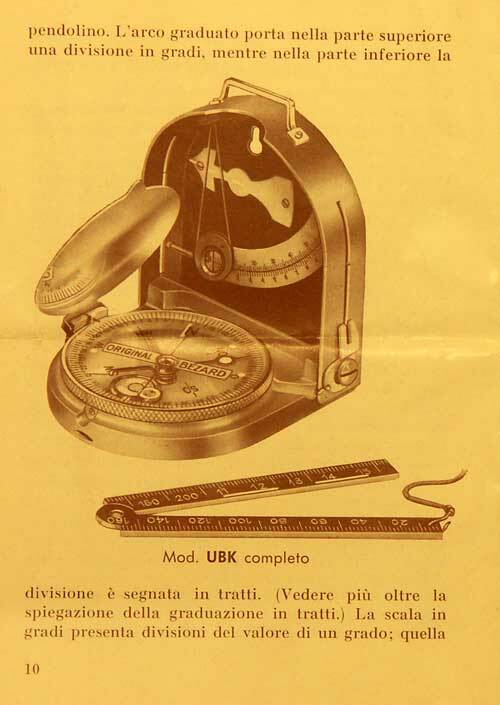 The Online Compass Museum would also be very grateful for any documentation (original or copy) concerning this instrument's history and technology (for our email address: see CONTACT). NOTE: The following resumee is a short version of a complete documentation (see pic. 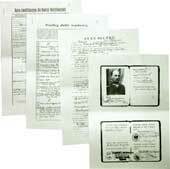 at right - examples: Soldier's ID-booklet, Civil status etc.) made by Tomasz Otrebski in Polish language and completed by the results of our own research work and translated into English, French and German (photocopies available). 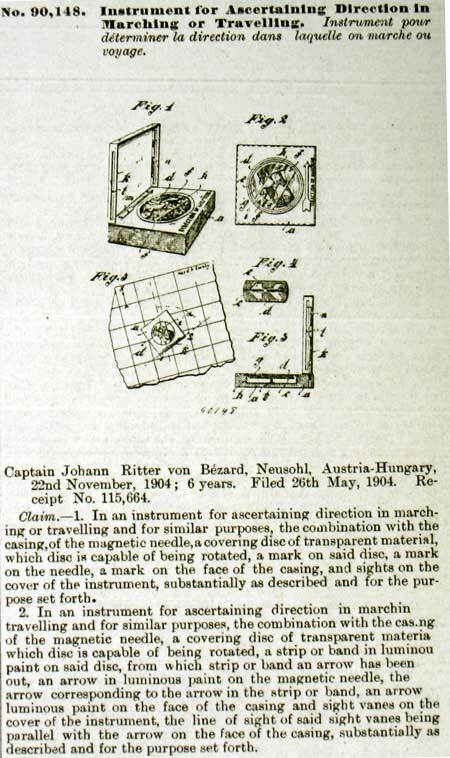 This compass was invented and patented in 1902 by Johann Ritter von Bézard (b. 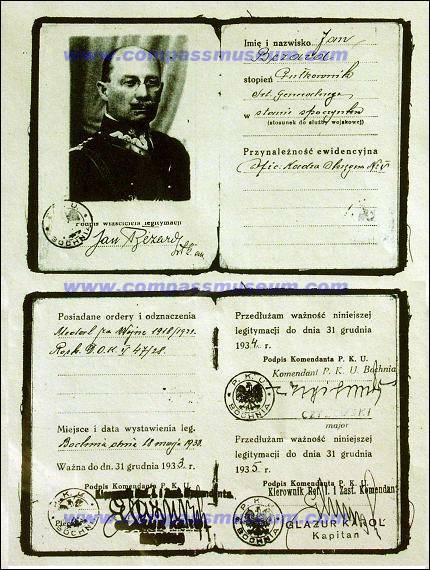 5.5.1871 - d. in 1954), an officer of Polish origin serving in the Imperial Austrian Army (southern Poland belonged to the Austrian Empire at that time). Ritter means Knight, a nobility title inherited from his father who had received the Medal Crown of Iron 3rd Class thus entitling its bearer to add "von" before his name. 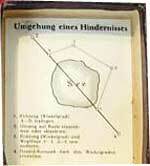 He taught military survey techniques at the Theresianische Militärakademie in Wiener Neustadt and at the Vienna Kriegsschule (War School) from 1905 to 1910. He was wounded and taken prisoner by the Russian army during WWI and exchanged against Russian POW's in 1918 because of his bad health (Spanish flu). 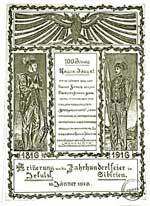 Historical document: Erinnerungen an die Jahrhundertfeier der Tiroler Kaiserjäger 1816-1916 (In memoriam of the 1st centenary of the Tyrolian Imperor's Fusiliers regiment, 11 pages) established when he was POW in Russia in 1916 and printed after the war. 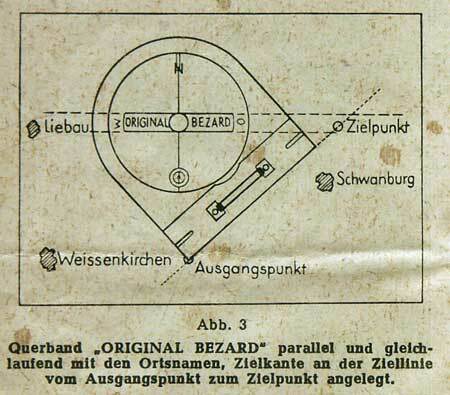 This document is not related to the compass but it is important since we can see here the inventor's original signature (note: the letters 'Obst' after the name Bezard is the abbreviated German word Oberst = colonel). The first 4 pages were made by fellow prisoners. 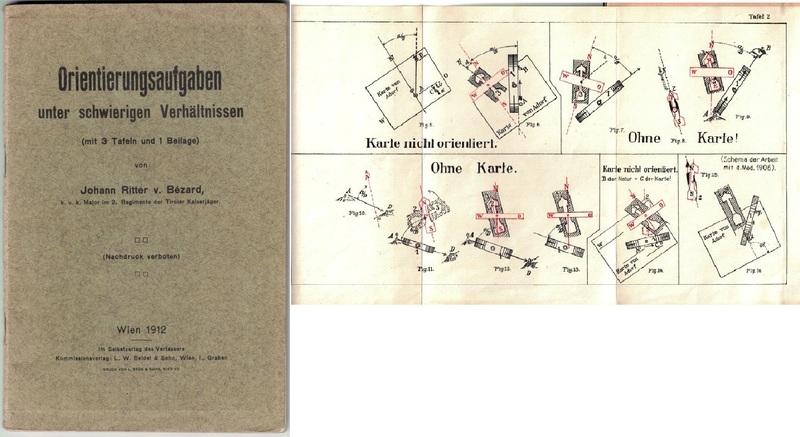 The rest is a description of the situation in the POW camp. 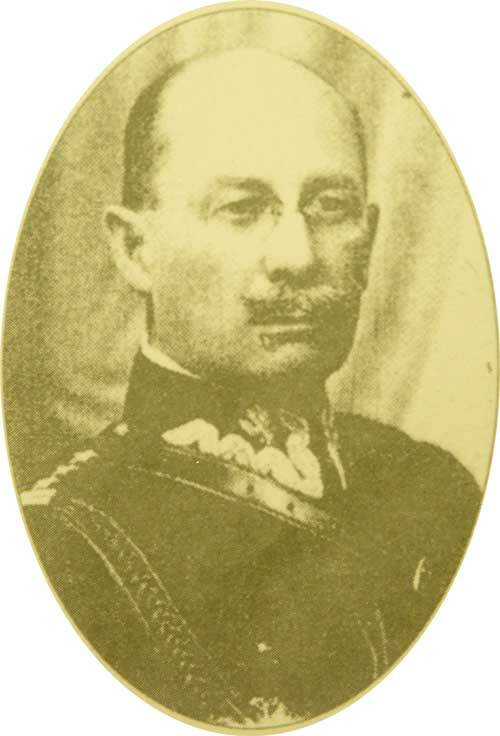 After WWI and the collapse of the Austrian Empire he went back to his country of origin that had become in 1919 a part of a newly created Polish state and he served in the Polish Army, fought against Russia in 1921-22 and was eventually promoted to General Staff Colonel. He retired in 1927 and stayed at his estate. 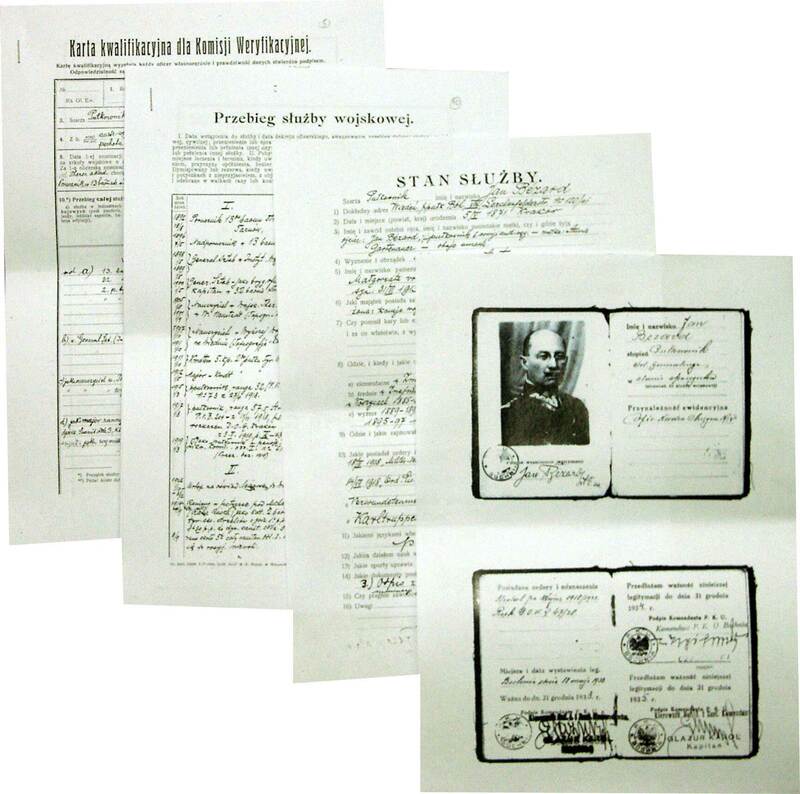 In 1946, the communist regime declared his assets and estate government propriety. He was in Turkey during WWII and came back to Austria after the war. died in 1954 and is buried in Vienna (link to cimetary plan). 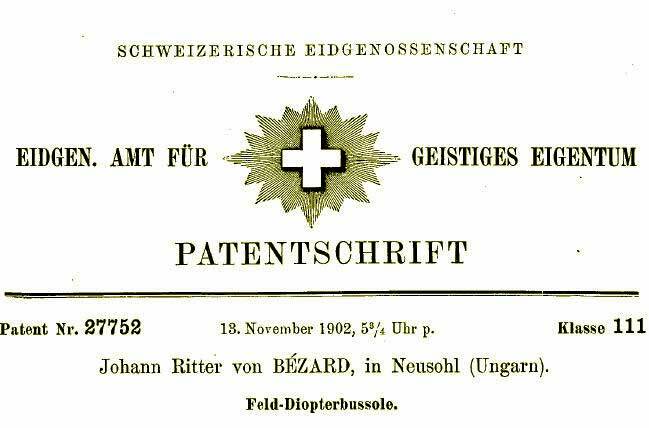 The system was patented in several countries at about the same time, starting with the German Empire (picture below, left) on November 25, 1902 by the then Captain Johann Ritter von Bézard domiciliated in Neusohl, Hungary (now Banska Bystrica in Slovakia). Austro-Hungarian Empire, German Empire, Switzerland, France, Great-Britain, Italy, USA and Canada. 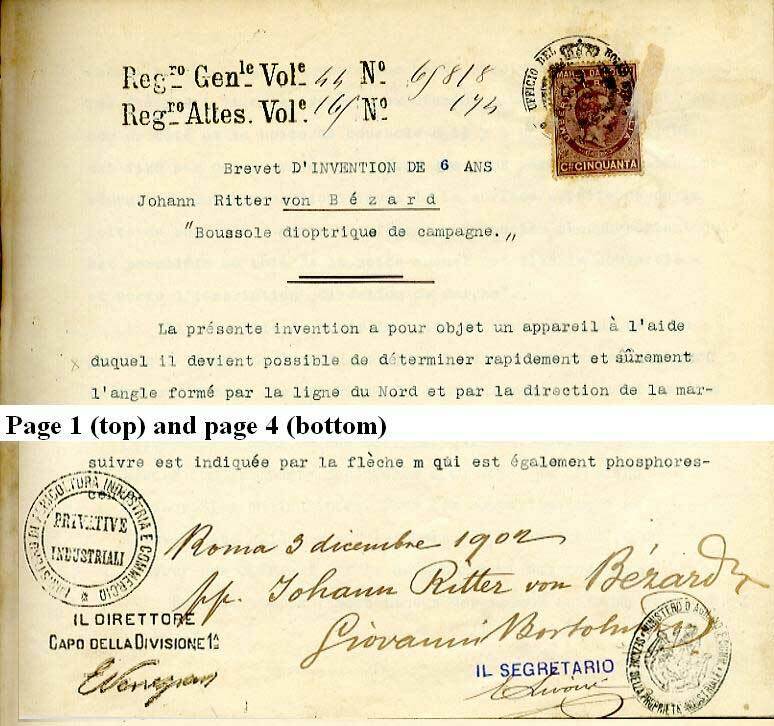 The text of a box (see below) and the S-L catalogue cover also states Russia and Japan but we have so far no copy. 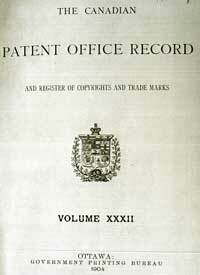 The patent for Italy was issued on the base of the French patent text (Detail photograph: click on the link). 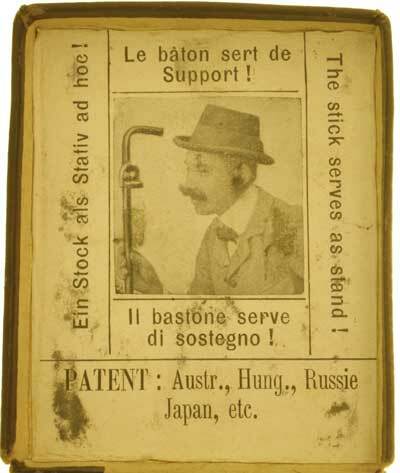 The inventor sold himself the first wooden model manufactured by a Vienna-based shop. 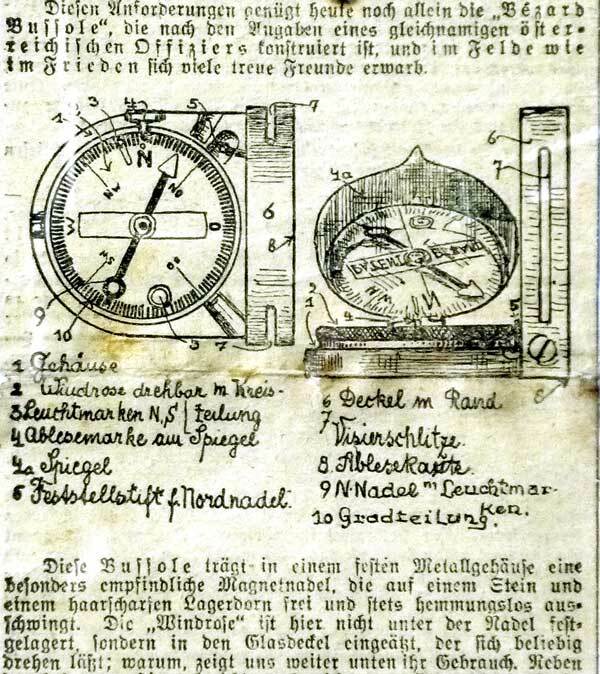 The German barometer manufacturer LUFFT (Stuttgart) took over production and further development from 1919 on when Bézard resumed his military career. 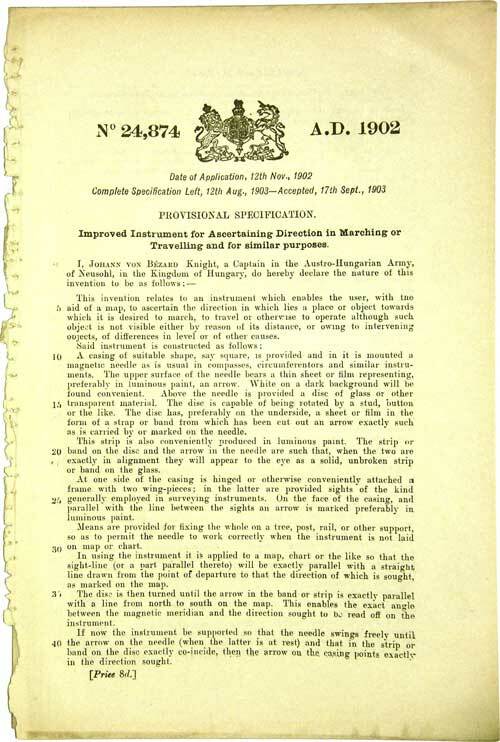 The patent's protection ending after 15 years, LUFFT probably stopped paying royalties in 1917. 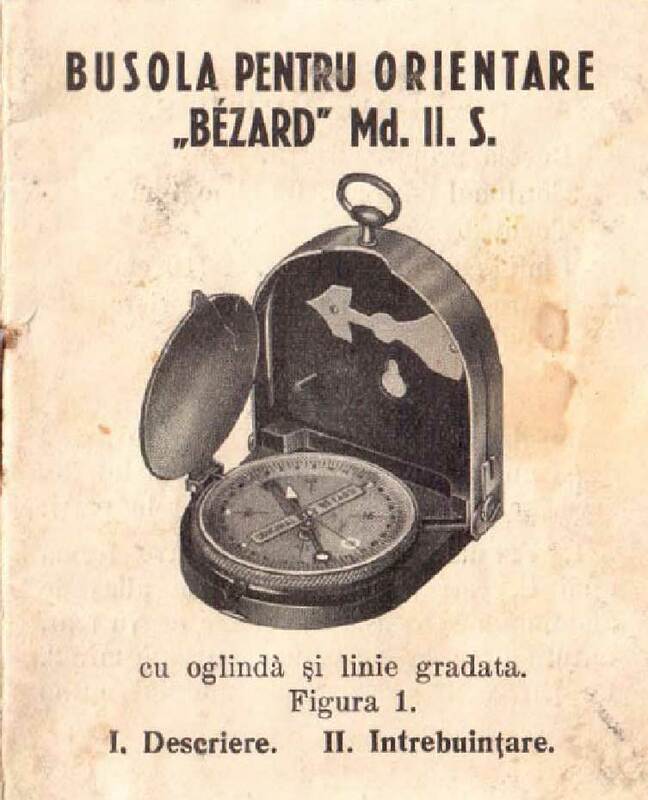 This was probably the moment when the original mention PATENT BÉZARD changed to ORIGINAL BÉZARD on the crystal and Bézard-Kompass on the case base. 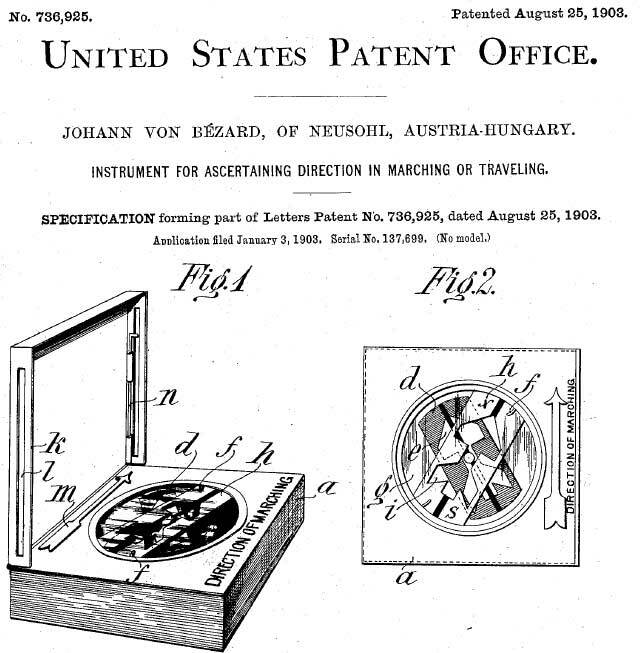 German-speaking visitors will note that the instrument's designation chosen for the patent title is different in each individual German-speaking country Austria, Germany, Switzerland! 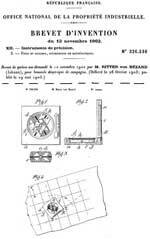 NOTE: The instrument described in the original patent was also retailed (and built?) 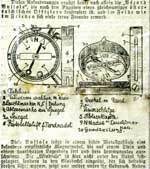 among other companies by the French nautical clockmaker J. Auricoste. Engraved below the serial no. 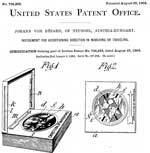 are the patent no. and the abbreviation D.R.P. 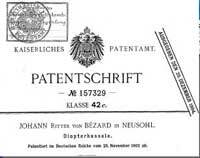 (Deutsches Reich-Patent). 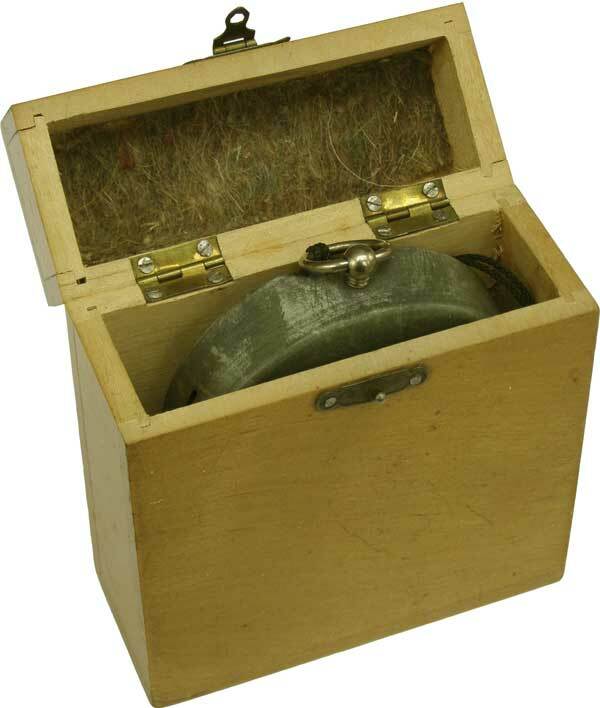 - The lid had two slots set in its sides to allow precision sighting of a target. 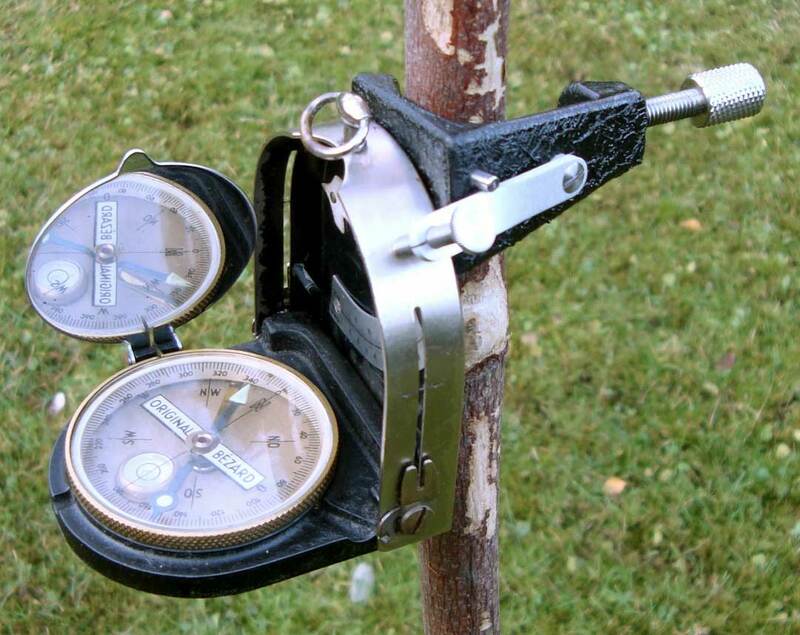 - The compass dial could be read simultaneously in a hinged mirror. The dial featured originally a red label aligned East-West. 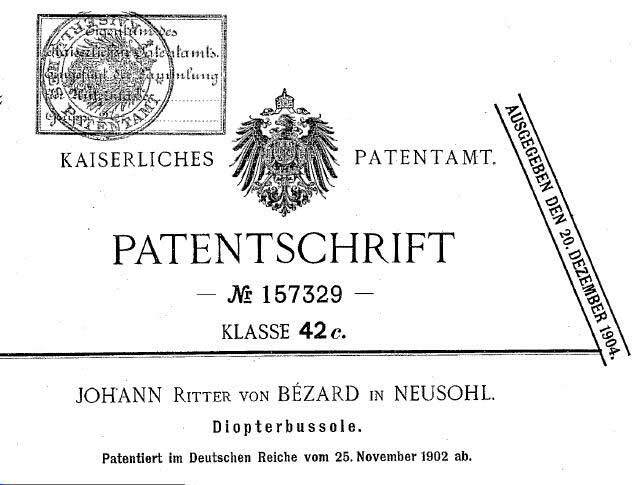 It comprised a logo containing the words PATENT BEZARD and the initials of the cardinal points at the ends (W and O for WEST and OST in German, Picture left). This label was an essential element when using the compass. 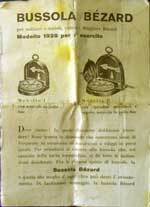 Nevertheless its handling seemed as simple as indicated in the labels in the boxes (see below). 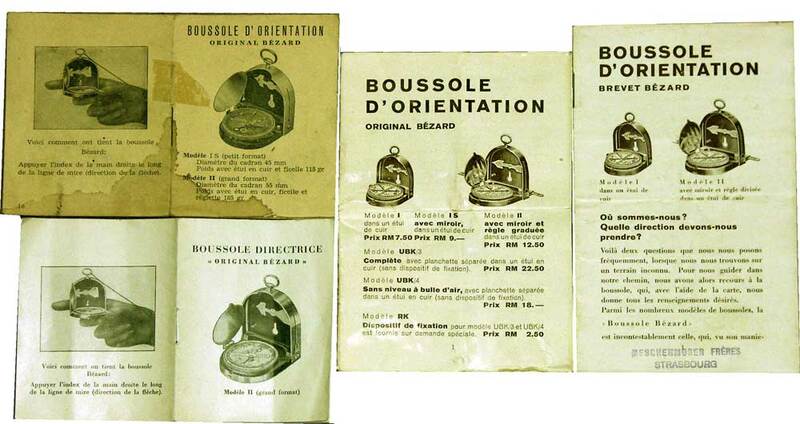 Used with a map one kept the label parallel with the place names indicated on the map, which are always written on an East-West axis, and turned the casing to place the base of the lid over the axis of the route to be followed to align a target from one’s present position. 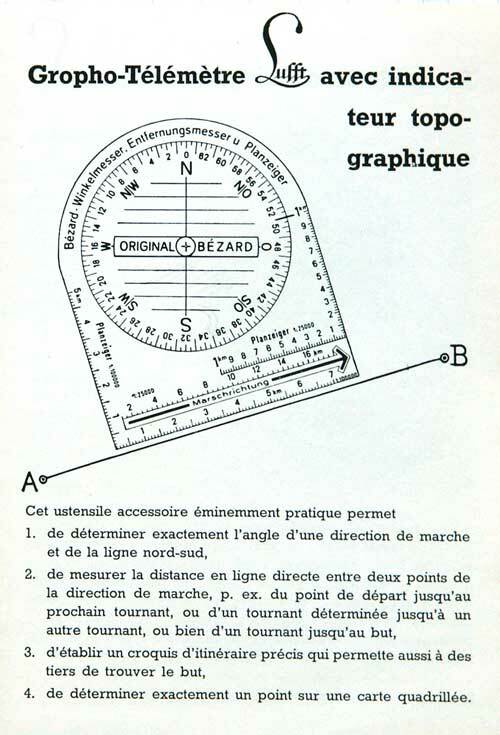 On the later versions the text was modified to ORIGINAL-BEZARD written in black on a white (luminous) background and also, later on, without the luminous background. 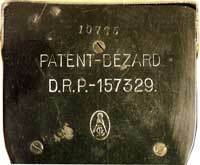 In the final version the Bezard was liquid damped, and the label carried the wording FLUID BEZARD in English between two white lines. 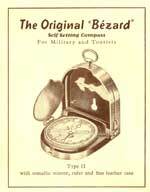 Sketch: The Bezard compass set on a map. While walking, you only had to hold the compass in such a way that the North point of the needle aligned with the magnetic North marker. The direction of travel was indicated by the luminous arrow fixed in the lid and by the word DIREKTION (or RICHTUNG) crossed with an arrow, engraved on the exterior facing of the lid. To detect the position of a target one had to hold the compass to the eye and view the target through the slots in the lid. The mirror, inclined at around 45 degrees, reflected an image of the card and the needle. 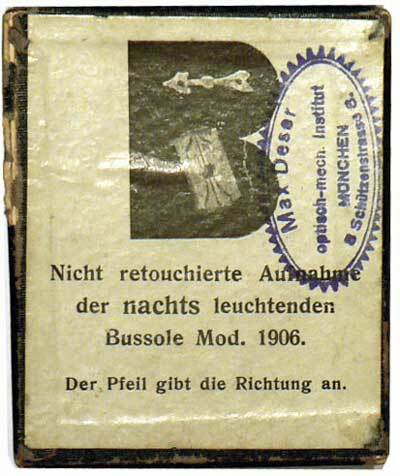 It was then necessary to turn the capsule until the arrow-shaped needle and the corresponding cut-out (or the South marker of the needle in the circle on the card) were perfectly superimposed. Taking a bearing. The compass could be fixed to a staff or a stick to aid taking a special bearing. 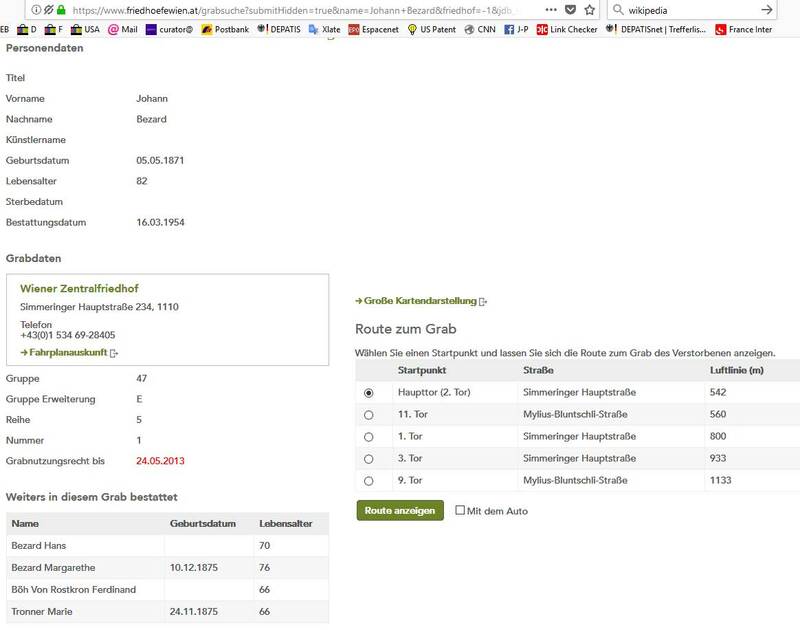 (see example by clicking on the picture at r. - photocopies available). 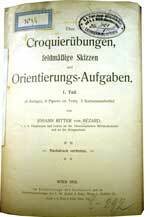 During his teaching period at the Vienna Kriegsschule (War School) and the Theresianische Militärakademie in Wiener Neustadt J. von Bézard wrote the comprehensive two-volumes-work about military surveying entitled Croquierübungen, feldmäßige Skizzen und Orientierungsaufgaben (Vol. 1, 133 p., 6 oversize tables; Vol. 2, 103 p. - dated 1910 - pic. at left - Austrian National Archives). 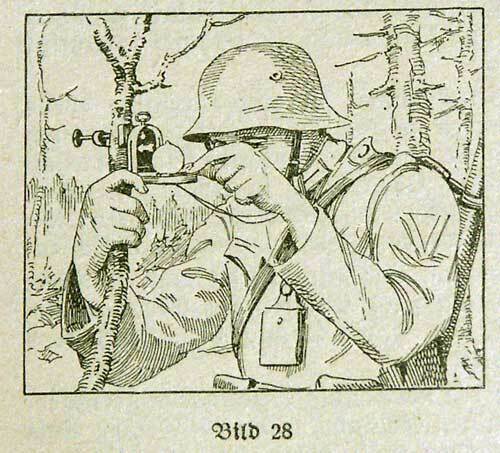 He describes therein the numerous reconnaissance tasks. 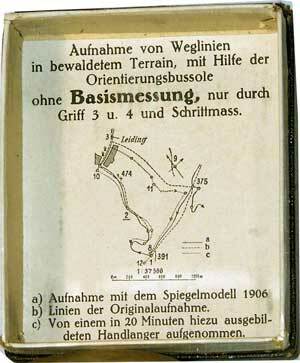 The scout (Rekognoszent) should perform a rapid drawing (called in German flüchtige Terrainaufnahme) of the landscape taking into account the particular aspects of the military needs. He can do this by using a sketch drawn from an official map which he should rectify since the official ones had been established in c.1872. He uses different forms of the French word Croquis. The verb croquer also means 'to draw' but Bézard differenciates Croquis and Skizze (sketch): the Croquis is an actual drawing made on the spot while the sketch is drawn at the desk on the basis of a map (see definition in the original text HERE). 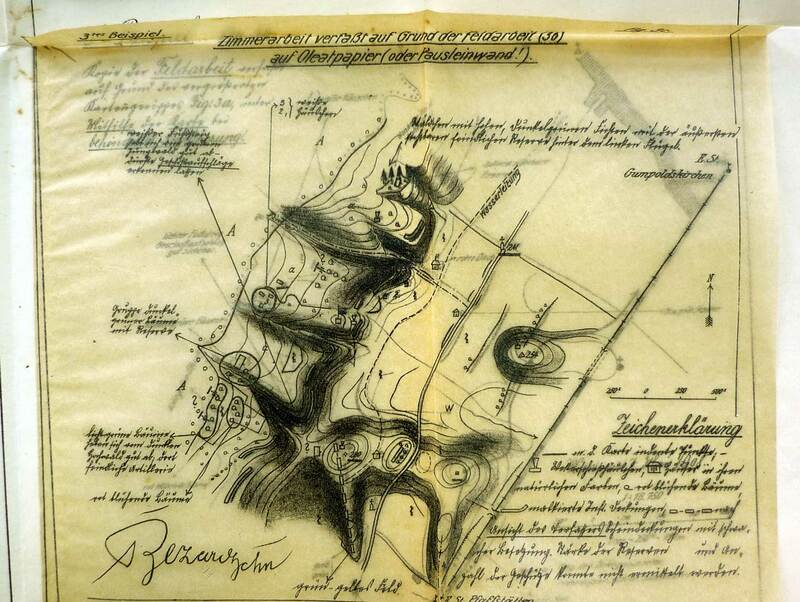 Croquis are drawn on transparent paper (called Oleat) and contain hand-written remarks (example HERE). 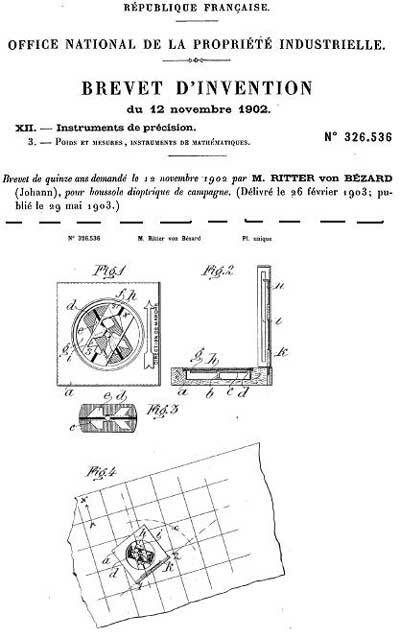 Naturally, Bézard's invention is also a major topic in several chapters (see example by clicking on pic. at left) and an oversized table displays the oldest known comprehensive user instruction (photocopy in A3 format available). 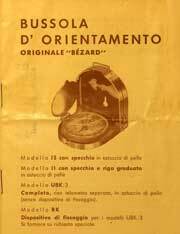 Other French words used by Bezard: Waldlisière = forest limit, Ravin = gully, Kote = height above sea level. 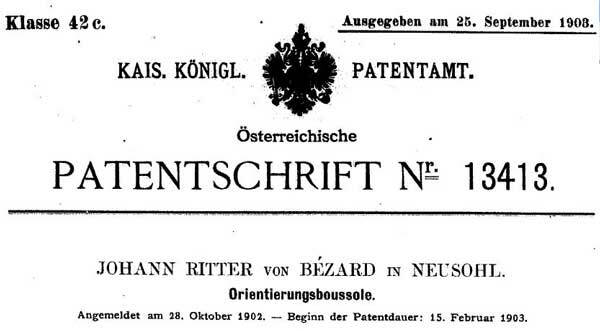 Essay Orientierungsbussole Bézard by Major A. Staubwasser, published in "Kriegstechnische Zeitung" (Armed Forces News), 1913, journal no. 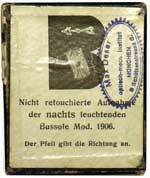 10, printed separately by Mittler und Sohn, Berlin W, Kochstr. 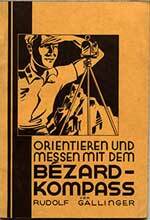 48 (Compassipedia unfortunately is not in possession of a copy, excerpts are quoted in the pre-WW1 User Instruction (see below). 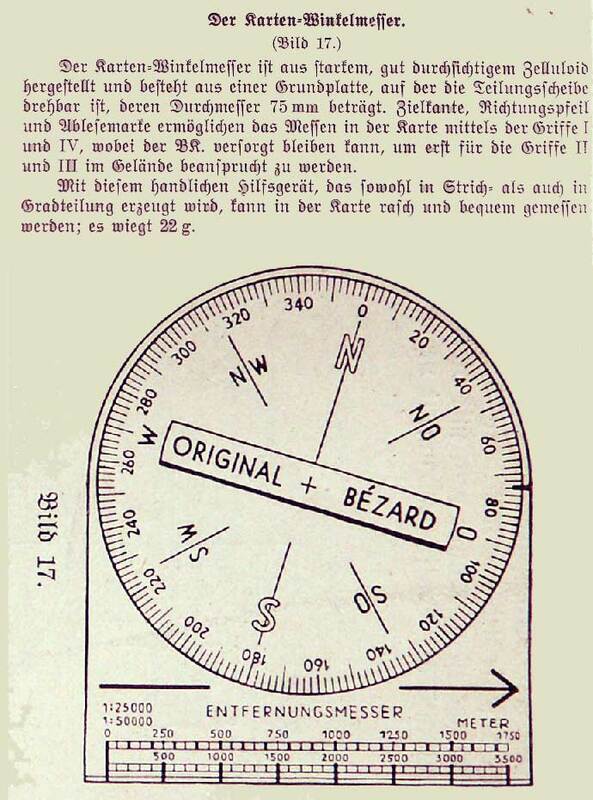 Essay Wegerkundung : plea for the adoption of this compass by the German army, published in a military journal with unofficial free-hand drawings (author unknown, his initials are: B. H. R., see pic. at left - photocopy available). 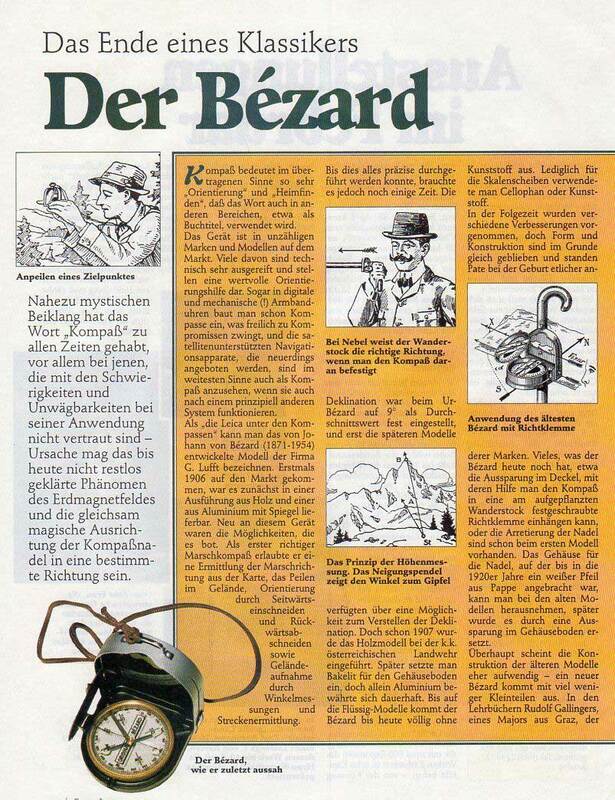 After production ceased in 1996 a long artikel was published in the collectors' SAMMLER JOURNAL (Febr. 1998) signed by A. Glück. 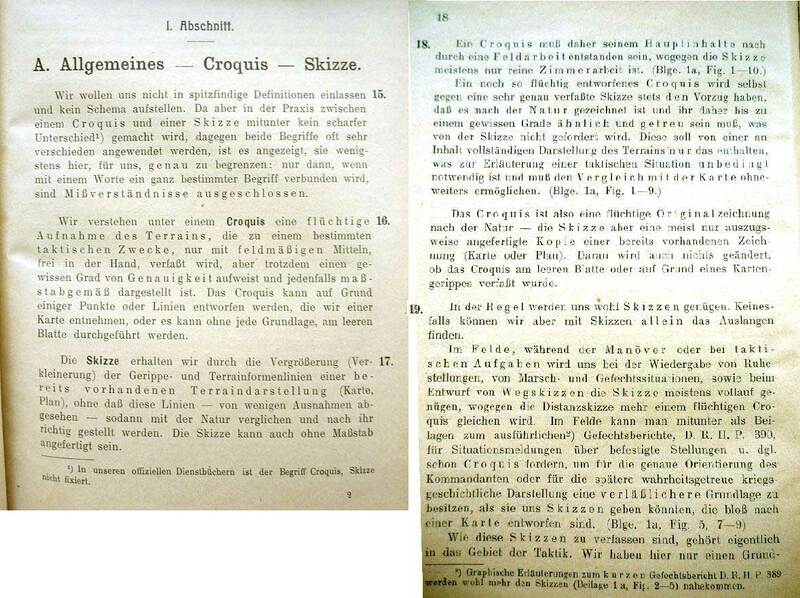 (pic at right, colour copies: € 5,-). 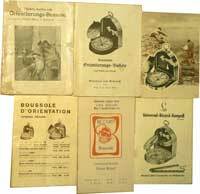 The most important publications are the manuals written by the Austrian Major Rudolf Gallinger who sold compasses, accessories and technical documentation in Graz (Austria). 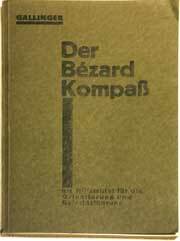 "Original-Bézard-Kompass" printed by G. Lufft Metallbarometerfabrik GmbH, 12 p. (1950's? ): for models I S and II. 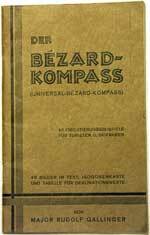 "Universal-Bezard-Kompass", printed by G. Lufft Metallbarometerfabrik GmbH, 8 p. (1950's? ): only for UBK model. 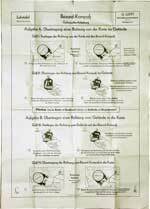 "Der Bézard-Kompass / Beschreibung und Gebrauchsanleitung": User instruction for the German Army, 24 p. 1957 (see table below). Pic. 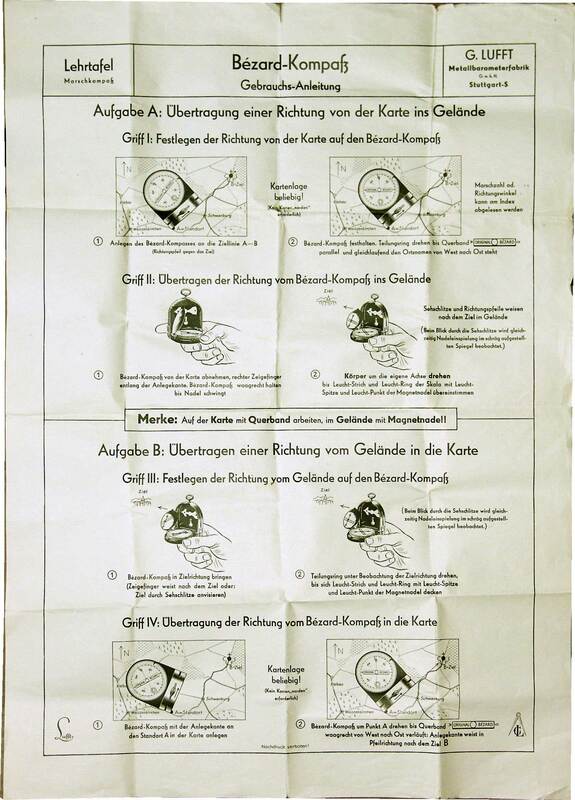 at r.: User Instructions (probably Swiss issue since featuring a map of Basle, early 20th c.) printed on both faces of a very large sheet of thin paper (73 x 25 cm) in black and red. 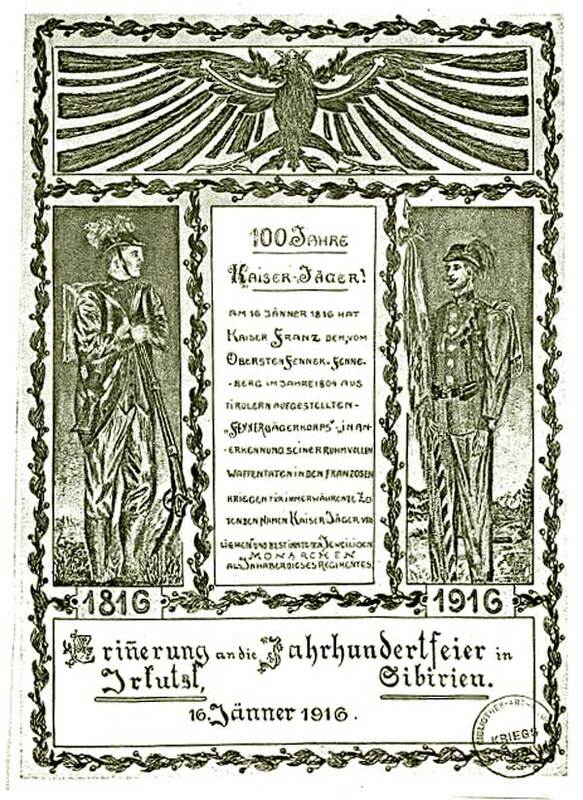 In the upper left corner of page 1 are drawings of medals awarded in the years 1902-1904, especially one depicting the imperial Archduke Ferdinand who was murdered in 1914 in Sarajevo and this started the 1st WW (copies available). 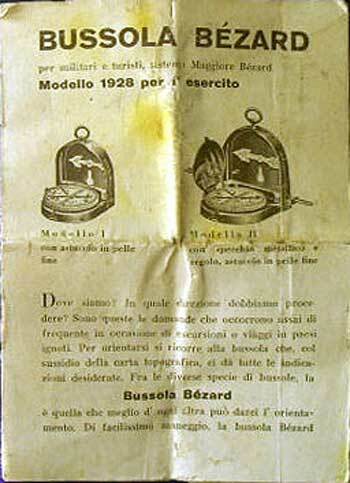 FRENCH - For French-speaking countries a (rather awkwardly translated) small-size notice was included with models exported prior to the Second World War. 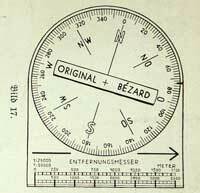 The large notice issued together with the French army compasses used after WW II was much better. 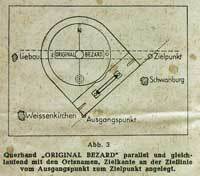 For the training of troops, the German Army (Bundeswehr) and the former border police (Bundesgrenzschutz) used a large-size poster called Lehrtafel. 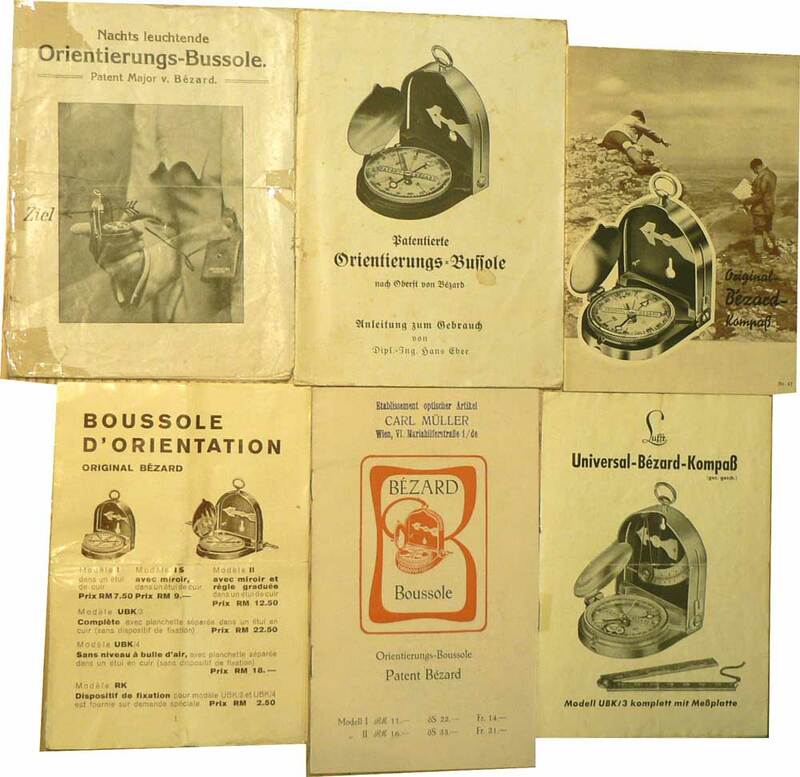 The 1957 user instructions handbook (the Bundeswehr was created in 1956) was an extended version of the older booklets. 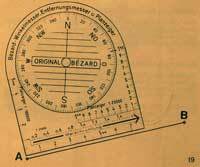 In addition to the description of the common models, it contained a description of the new fluid dampened compass and an updated map of the magnetic declination in Europe, from the Atlantic coast to Warsaw. 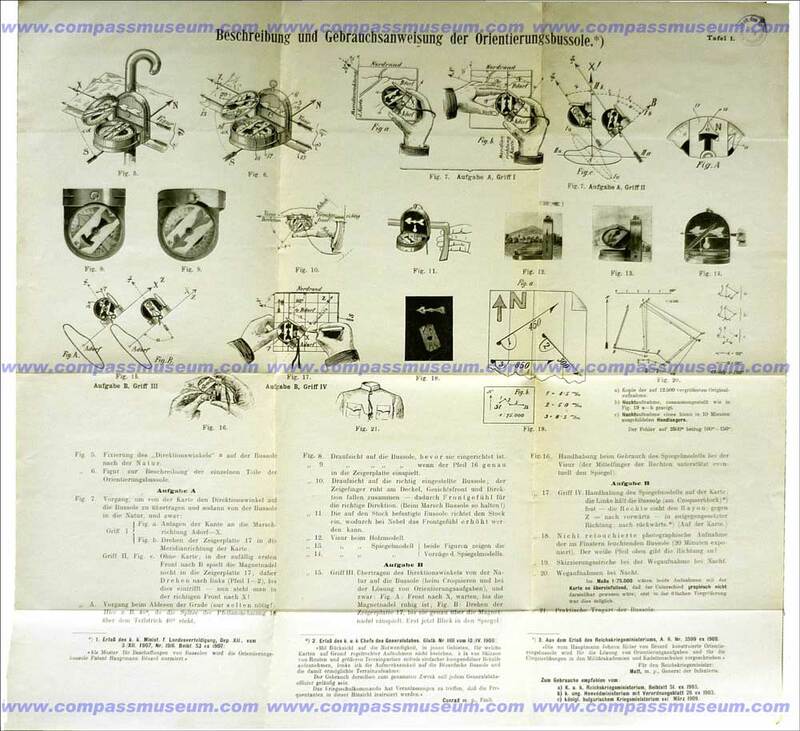 View of the 24 pages booklet: pages displaying the new fluid dampened compass. 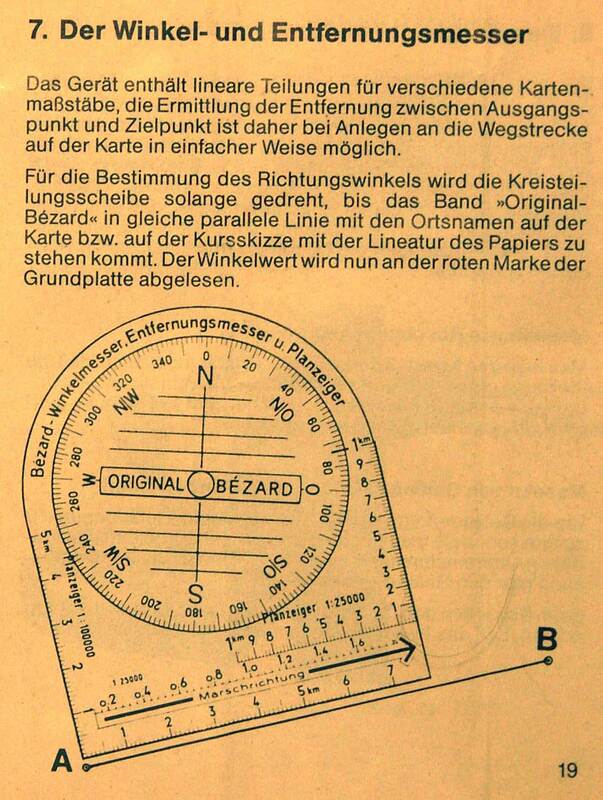 Last page is the map of magnetic declination in Europe. Mean values for 1957, established on the base of information delivered between 1954 and 1956 by various authorities incl. the British Admiralty. 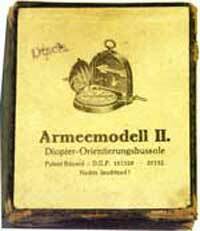 The two models (Armeemodell 1910 I and II) were supplied in cardboard boxes on which the printed illustrations formed the instructions. 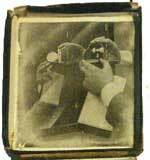 A photograph taken in front of a mirror showed the correct way to hold the compass. 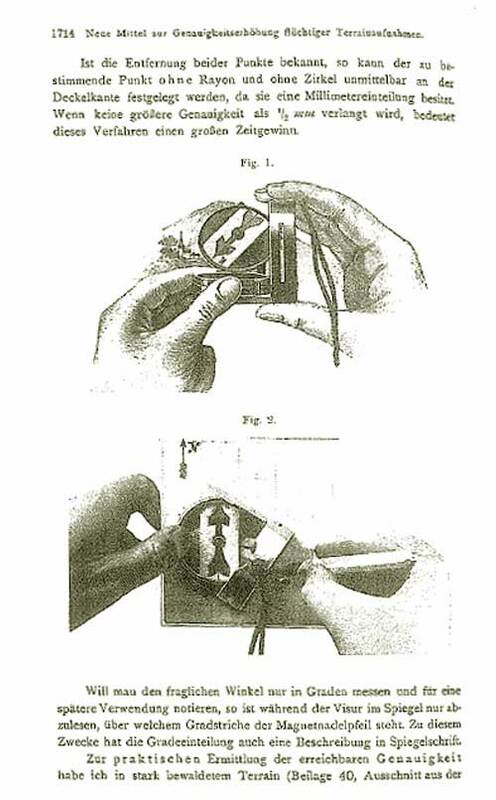 Different illustrations for different models showed the way to use the instrument, those for Model I being slightly simpler than those for Model II. Here are a few examples. 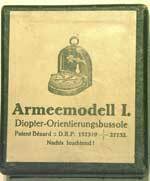 The box of the first produced version (1903) featured the patent number in several countries. 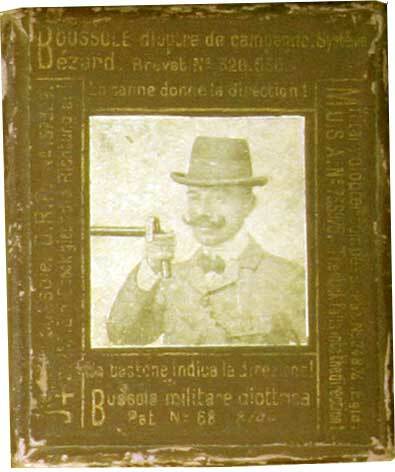 The inner surface was printed in four languages. 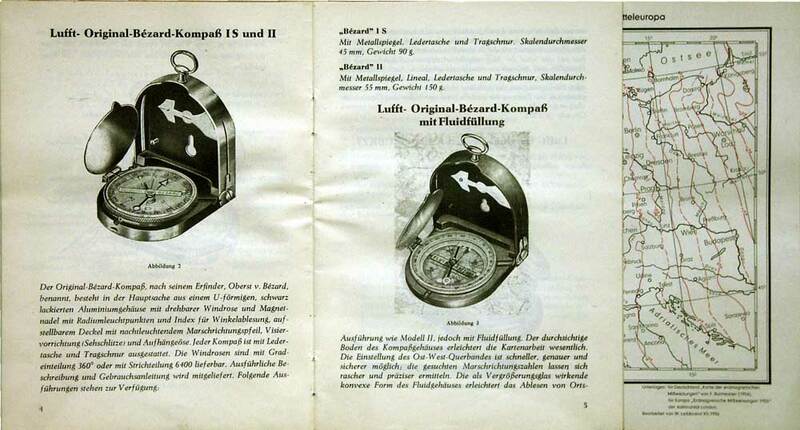 Picture at right: Modell 1906 - The luminous arrows inside the lid and on the compass rose. 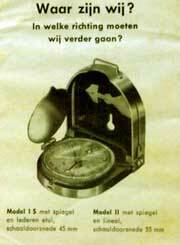 The picture inside the lid shows how to hold the compass. "Von einem in 20 Minuten hiezu ausgebildeten Handlanger aufgenommen"
- Stamp (red): "Armeemodell 1913 mit Rad"
(see also description in a French flyer). 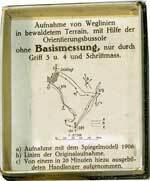 The word Richtklemme can be translated with aiming clamp. 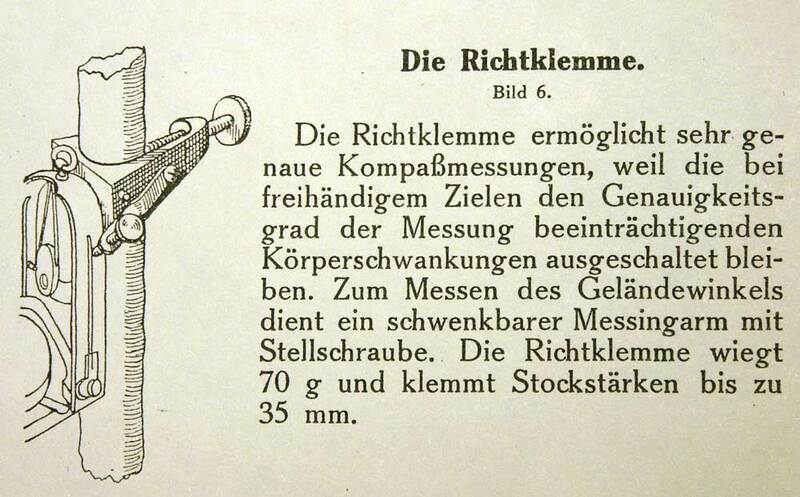 The German verb richten means to direct a canon at a target. 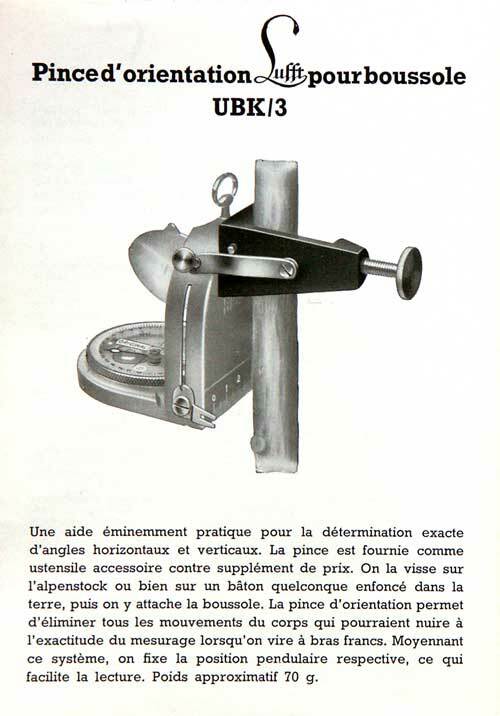 The first circular protractor (called Karten- Winkelmesser, 1930s) featured two scales (1:25.000 and 1:50.000). 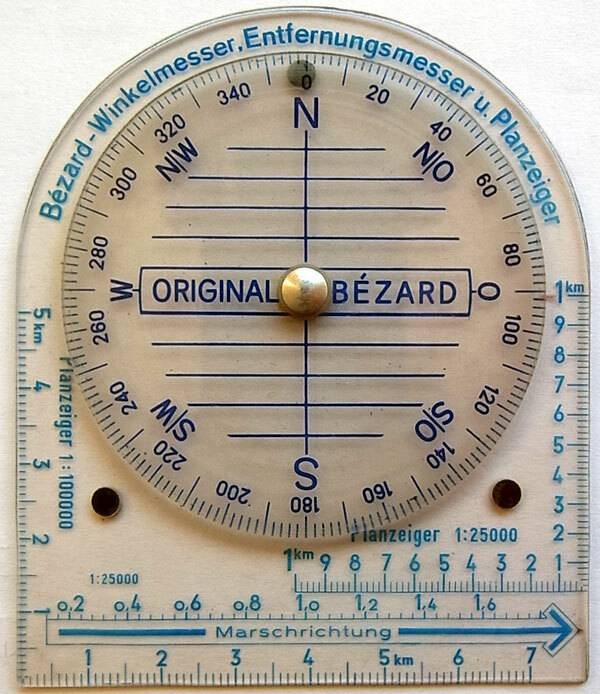 The improved square protractor (called Planzeiger) featured two scales (1:25.000 and 1:100.000) located in the corners of the baseplate made by LUFFT, the manufacturer of the altimeter recommended in the documentation. 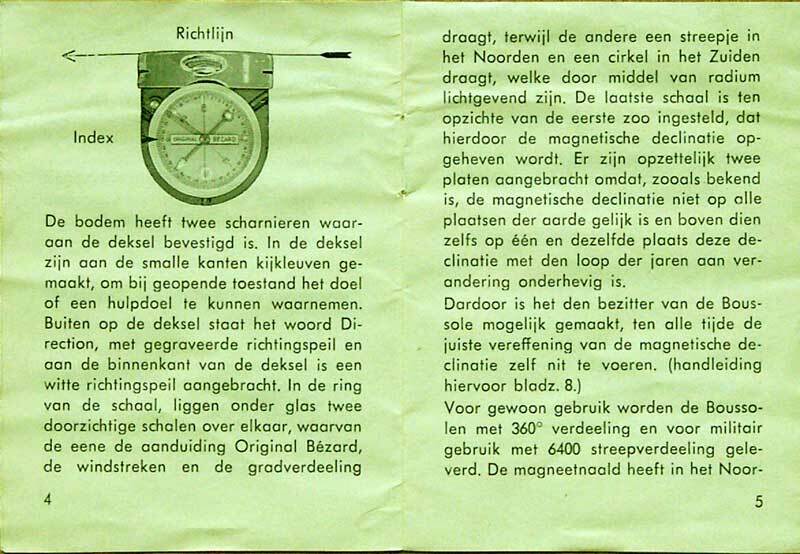 It existed for 360° (below at left) and 6400 MILS (below at right, description in a French flyer). 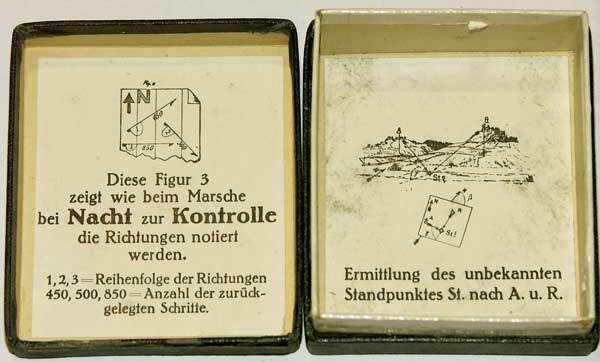 A very early addition to the compass was this "night marching card or map", in German Nachtkarte. 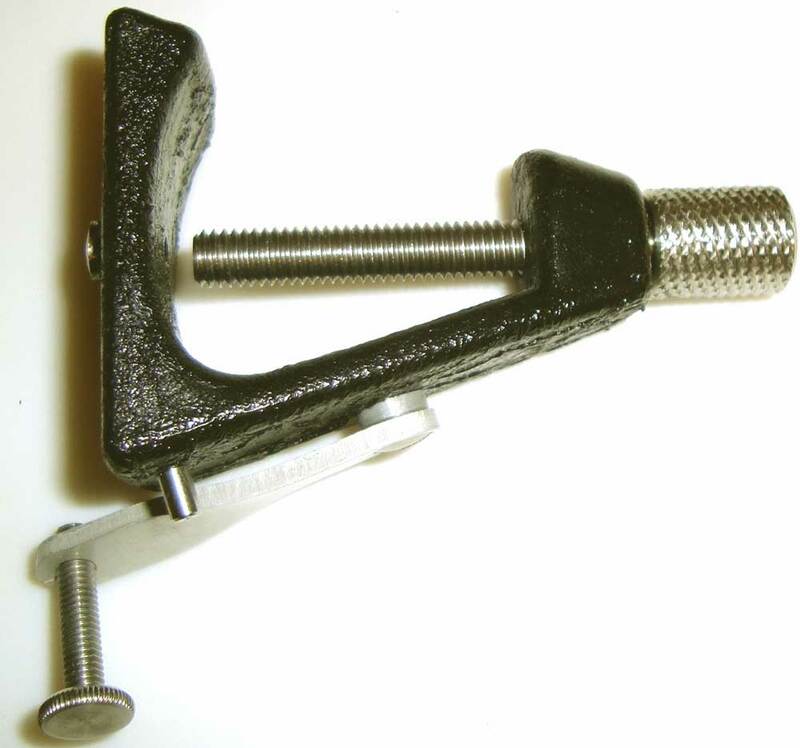 We only know this tool by it being mentioned in the large user instructions (p. 5 of the 73cm long sheet, see above). A precise description is missing. We can only assume how it was made. Apparently it was composed of a sheet of cardboard covered wit luminous paint. 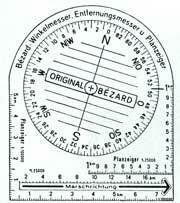 It is said that the compass had to be rendered luminous at night by burning Magnesium. 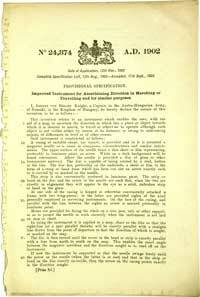 This means that it was used before the Radium-compound paint was introduced (c.1913). 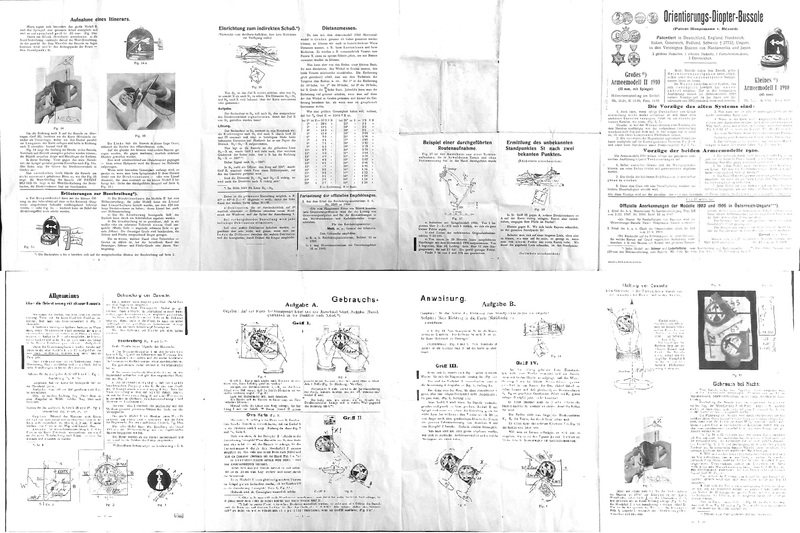 According to the user instructions (s. enlarged view of img. at r.) two thick horizontal lines were already drawn on the card as an aid to orientate the compass stripe (W - PATENT BEZARD - O). First, one had to draw on the original map the planned track and measure the angles and the distances (converted then in a number of steps). These values were then transfered to the night marching map in short form and with a thick pencil so as to be legible in relative darkness. The officer probably had to carry a number of these cards.